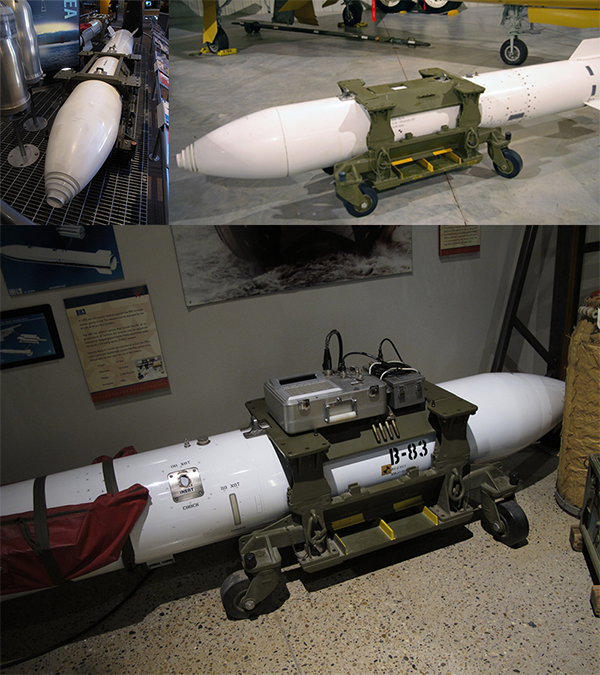 Currently in the United States arsenal, the B83 is is a variable-yield gravity bomb with a maximum yield of 1.2 megatonnes of TNT (5.0 PJ, 75 times the 16 kt yield of the atomic bomb "Little Boy" dropped on Hiroshima on 6 August 1945). Quote: The B83 replaced several earlier weapons, including the B28, B43, and to some extent the ultra-high-yield B53. It was the first U.S. nuclear weapon designed from the start to avoid accidental detonation, with the use of "insensitive explosives" in the trigger lens system. Its layout is similar to that of the smaller B61, with the warhead mounted in the forward part of the weapon to make the bomb nose-heavy. It was intended for high-speed carriage (up to Mach 2.0) and delivery at high or low altitude. For the latter role, it is equipped with a parachute retardation system, with a 14-meter (46 ft) Kevlar ribbon parachute capable of rapid deceleration. It can be employed in free-fall, retarded, contact, and laydown modes, for air-burst or ground-burst detonation. Security features include next-generation permissive action link (PAL) and a command disablement system (CDS), rendering the weapon tactically useless without a nuclear yield.